Listen to Mando and the Chili Peppers on South of the Border and Congo Mombo. Mando and the Chili Peppers have perhaps inspired more fantasy and fancy than anyone else in the hallowed halls where the Mystic Knights of the Mau-Mau dream up their doings. They've topped the wish list from day one; their shrine is bowed to daily in the Knights' Hall Of Fame; toasts are often seen raised to the glory of their sole long player, 1957's On The Road With Rock 'n' Roll. So the very idea that they're going to be playing the 2005 Ponderosa Stomp is at once unbelievable and at the same time just as it should be. If you're wondering what all the fuss is about, take into account that Mando and the Chili Peppers are no ordinary band. In fact, at times their very existence has seemed almost too good to be true. The aural evidence suggests a group of swamp pop fanatics (who also have a particular affinity for jazz, country and western and Little Richard) raised in a border town barrio recording at Cosimo's studio in New Orleans' quite possibly with a few Crescent City cats sitting in on the session. And where did they disappear to after churning out that one great long player of the ages? Rumors that some of the band moved to Chicago and worked with Eddy Clearwater seemed at once too good to be true and yet…well, but of course!! Led by one Armando Almendarez, nee Mando, the Chili Peppers originally came to life as San Antonio Alegre before changing their name to the slicker Mando and the Latineers. Texas guitarist Randy Garibay recalled the band's glorious beginnings for an article in the San Antonio Express News: "I'd go to these house parties with my brother and this guy Armando Almendarez and San Antonio Alegre would be playing. They'd do the standard polkas and boleros and then, all of a sudden, with Mando playing accordion, they'd break into 'Lucille' or 'Just Because' by Lloyd Price. It was amazing. That's when I first heard rock 'n' roll." he blazed through breakneck renditions of Chenier's "Boppin' The Rock" and Chuck Berry's "Maybelline" alongside the usual crudely-recorded conjutos that the label specialized in. When Mando swapped his squeezebox for an electric bass and boyhood pal Jesse "Chucho" Perales traded his bajo sexto for an electric guitar, the Latineers were born. By 1956 they had their own TV show on San Antonio's KCOR entitled "Rock 'n' Roll"(!!) and were the proud owners of a black Packard limousine which took them to engagements in Vegas and Denver, where Golden Crest Records boss man Clark Galehouse staggered upon one of their red hot stage performances in the middle of a snow storm. If the liner notes to On The Road With Rock 'n' Roll are to be believed, Galehouse, a Long Island plastics manufacturer who dabbled in big band recordings, was only in Denver due to the blizzard that had grounded his plane en route to a music convention in Idaho. Galehouse changed their name to the Chili Peppers and released their first single, a swampy, Fats Domino-esque treatment of the 1939 standard "South Of The Border" backed with the bayou-meets-barrio rocker "Don't Say Goodnight." The results were magical. The band's insistent, triplet-infused back beat coupled with Mando's lilting, laid-back Tex-Mex vocalizing made "South Of The Border" the absolutely definitive rendition of an already great song, and it became a hit along the Gulf Coast, particularly in New Orleans. They followed it up was the frantic mambo-charged "I Love To Eat Chili in Chile," which sounded like Perez Prado cutting loose with a Crescent City R&B band. It's flip side, a Mando-ized version of George Morgan's country classic "Candy Kisses," pointed the way to the future: When On The Road With Rock 'n' Roll hit the racks (complete with an in genius cover photo of the band parked on the side of the highway strapping a bevy of Fender amps and guitars to the roof of their Packard! ), "San Antonio Rose," "I'm Walkin' The Floor Over You" and "There's A New Moon Over My Shoulder" stood proudly alongside originals like "Why Can It Be," "Swingin' Baby" and "This Is True Love." There were also stripped-down, rocked- up pop numbers like "Someday (You'll Want Me To Want You)," "Beg Your Pardon" and "Harbor Lights," Marvin and Johnny's slow burning Pachuco anthem "Cherry Pie" and, perhaps most tellingly, a crazed, balls-to-the-wall take of Guitar Gable's "Congo Mombo." On The Road With Rock 'n' Roll was a bold step for Galehouse, as LPs were a rare commodity for rock 'n' roll bands in 1957 (two years later, he'd roll out the red carpet for Tacoma, Washington's similarly rocking Fabulous Wailers, whose stunning debut LP was unleashed in 1959), but the album stands as one of the best ever, genres be damned. Not long after its release, the Chili Peppers drifted into rock 'n' roll's bottomless underground. 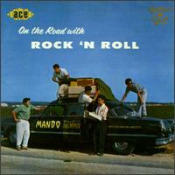 By the time Ace Records reissued On The Road With Rock 'n' Roll in 1998 the members' whereabouts were completely unknown. Seven years of detective work later, the Tex-Mex rock 'n' roll pioneers are set to play their first gig in over forty years! !